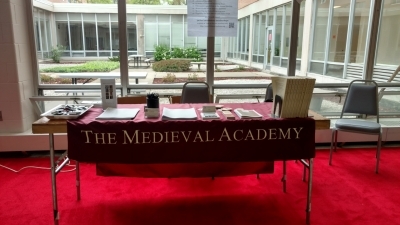 As always, the Medieval Academy of America had a strong presence at Kalamazoo. The Medieval Academy plenary lecture delivered by Jane Chance (Rice Univ.) was well-attended and -received, generating much discussion and comment about Tolkien and his take on female characters in Anglo-Saxon literature. The two associated sessions on “How We Read” were very well-attended as well. The two roundtables sponsored by CARA addressed important topics and sparked lively discussions: “Writing the Middle Ages for Multiple Audiences” and “Addressing Career Diversity for Medievalists.” The annual CARA Luncheon followed the same model as last year. Each of the more than forty attendees was assigned to a table at which facilitated discussions of various topics took place. Participants shared issues of concern and helped each other brainstorm solutions and strategies. Some discussions have continued by email as participants follow-up on ideas and suggestions. Finally, the Graduate Student Committee hosted its own roundtable, “The Modern Grail: Insider Tips from Search Committees to Land That Academic Job,” followed by a reception. Even though the wine hours had been relocated from Valley III to Bernhard, our staffed table in the exhibit hall served as a lively homebase, with many Congress attendees stopping by to conduct business, ask questions, or just say hello. We want to send a warm welcome to the fifty new MAA members who received free one-year memberships. We look forward to working with you all in the coming year.